The protest centered on Cove Point, an export terminal that could be constructed in Maryland, about 50 miles from the White House. The “Stop Cove Point” protest marked the first-ever sit in at the Federal Energy Regulatory Commission. More on the larger march and protest that same day in DC. Activists already back in May packed a FERC hearing about LNG export from Cove Point, singing “We all know FERC’s a rubber stamp machine. Cove Point is the same problem with the three already-authorized LNG export operations right at the end of the Transco -> Sabal Trail -> FSC pipeline in Florida. 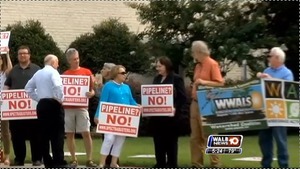 Which is one reason landowners and other SpectraBusters protested at a trespass hearing in Leesburg, GA 10 July 2014 against FPL and Spectra Energy’s Sabal Trail fracked methane pipeline. Every protest against every pipeline and LNG export operation helps every other protest stop the LNG export and pipeline eminent domain madness.